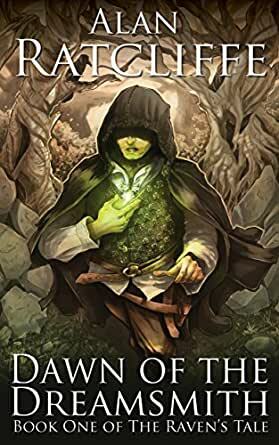 Dawn of the Dreamsmith is the first part of a new epic fantasy trilogy. 5.0 out of 5 starsOne of the best in today's age that I've come across. And so begins the rise of another good author. Very good to see, and for us fantasy loving readers, a pure treat. To all you prospective readers, I will say only this: this books will draw you in, that is a guarantee. And in the end, that is what really matters, no? Whether you like the story or not, whether you like the characters or not is up to you to decide -I personally liked both- but what I can tell you with certainty is that you will immerse yourself into the world. Beautifully detailed in a way that will never leave you lacking in creating a vivid picture of what the author wants to tell you. This is my favourite genre of books, and as such I've read a lot of the new ones that have come out in the past 5-10 years, and what I can say for certain is that the writing is as good as any of the best that have come out in that time. Give it a go, you'll not regret it. We've a very promising author here who I hope will facilitate for us many more moments lost in the lands of imagination. 5.0 out of 5 starsEnjoyable fast-paced read, would make a good movie! This was a very enjoyable fast-paced read. The writer keeps a number of story arcs going through the book and manages to tie them all up for a satisfying conclusion. The main characters are developed well. The tension builds throughout the story, which while pretty dark in content, has a good spattering of humor in there as well to lighten things up. The main character Cole and his sidekick being the primary sources of comic relief. The main antagonist has a suitably evil and scary aura around him, and I liked the way more layers were added to his character towards the end of the book (being very vague here so as to avoid spoilers). Some attempts at surprising the reader were unsuccessful, but I can say I didn't see the end coming at all. Will be on the lookout for the next one in the series. 3.0 out of 5 starsChoose your own headline, I can't because the book has explained nothing. I guess I am about 15-20% into this book. I think I have been paying close attention, but at this point I have NO IDEA about the background of these characters, the world they live in, or what motivates their behavior. There has been some intense action, and some lines have been drawn between the "good" and the "evil" forces - but that's about it. Predictably, a young woman and a young man - introduced in separate chapters - have been thrown together during a forest ambush scene. Maybe things will pick up from here and pent up explanations will flow abundantly. I am not motivated to take a chance. A good read. A little slow in places and over all worth the time. I am left eagerly waiting the next book. The story was very rich in detail and the characters very well developed. I found myself wanting to know more and more about each one. I am enjoying each twist of the story and can't wait for more.